As some of you all already know, I have been a recipe contributor for Real Housemoms since August of last year. 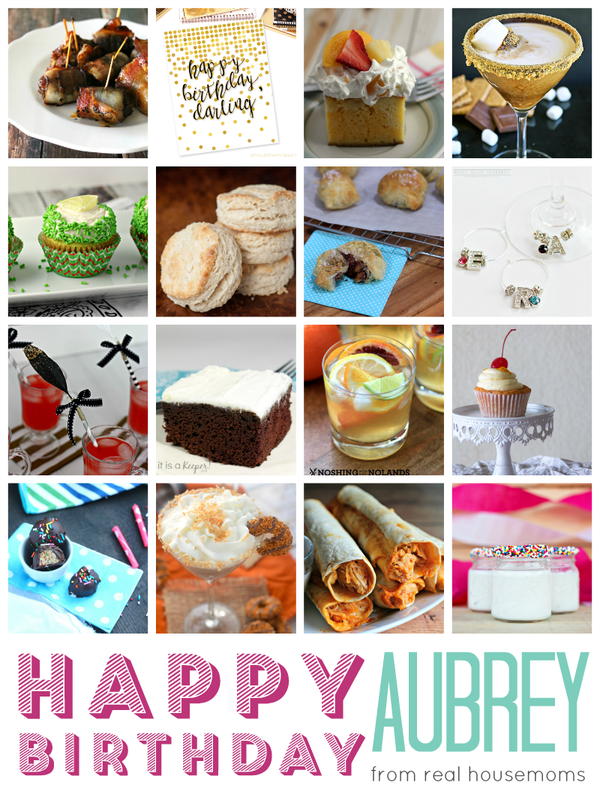 I am always looking for ways to improve upon and grow this little blog of mine, but I had no idea when I joined Aubrey's talented team of bloggers just how much it would do for Frugal Foodie Mama and for my growth personally as a blogger. For Aubrey, having blog contributors isn't just about curating fresh and new content for her own blog. She has been amazing in promoting and supporting the work that we all do on our own individual blogs. While I would definitely categorize Aubrey of Real Housemoms as one of the "big bloggers" out there, she has remained down to earth and is always so generous and open with sharing her experience and knowledge with each of us. Prepare the cake batter and bake the cake according to the box directions for a 13x9 inch cake. Cool the cake for at least 15 minutes in the pan and then poke holes in the cake in 1/2 inch intervals with a fork. Add the boiling water to the gelatin and mix until the gelatin is dissolved. Stir in the chilled white wine. Pour the gelatin/wine mixture evenly over the cake. Refrigerate the cake for at least 3 hours. Before serving the cake, prepare the whipped topping frosting. 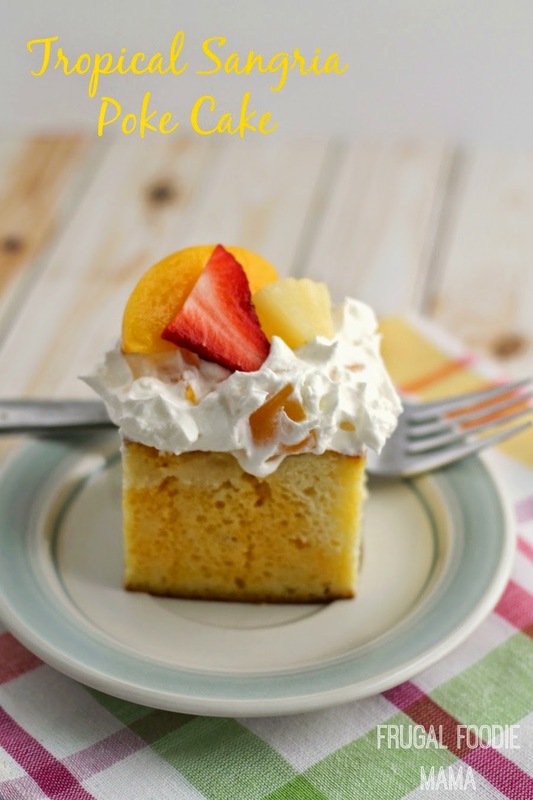 In a large mixing bowl, combined the thawed whipping topping, the pineapple chunks, and chopped peaches. Using a rubber spatula, fold the 3 ingredients together until well combined. Top the cake with the frosting and then garnish with fresh strawberry slices. Serve immediately. Be sure to cover and refrigerate any leftover cake. Enjoy within 3-5 days. Adapted from this recipe for Gelatin Poke Cake from Kraft. 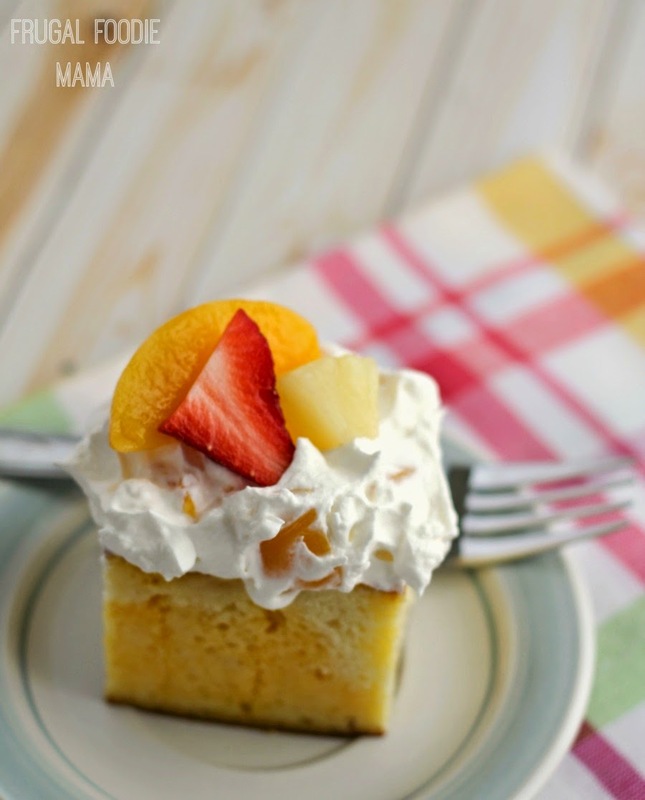 Another awesome thing about this poke cake? It is totally versatile! Use yellow cake mix instead. Try different fruity flavors of gelatin in this. 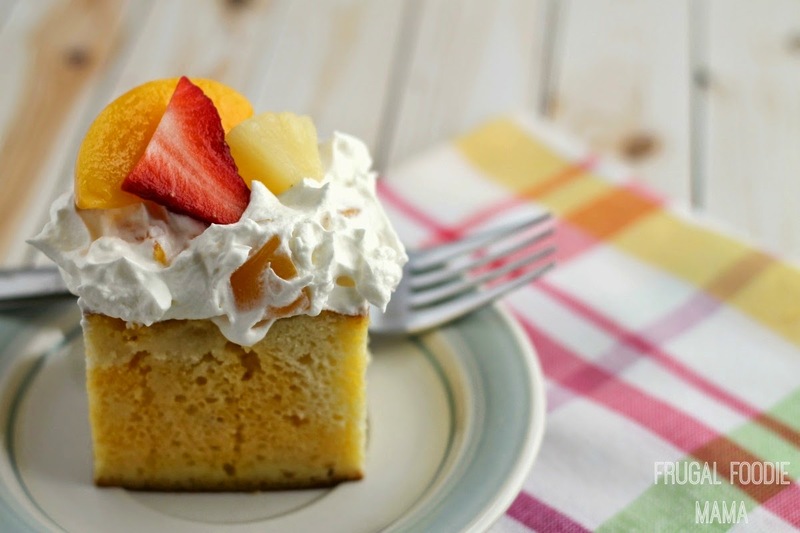 Use different fruit in the whipped topping frosting- like kiwi, mandarin oranges, or fresh mango chunks. The possibilities are pretty much endless with this one, folks. I used a nice moscato for the white wine, but just about any white wine you have on hand will work in this.